The integration of migrants from outside the EU into society is one of the key challenges that the Union must address to maintain social cohesion and equality. This blog piece looks at how well migrants and their descendants have integrated into the labour markets of EU Member States. The classic theory on how migrants and their descendants assimilate into a host society argues that integration is a linear process as successive generations gradually come to resemble the native population. This was the dominant theory up to the 1990s; in recent decades, alternative theories have proposed more complex processes of adaptation to explain why some ethnic minorities integrate better than others. These theories emphasise, for instance, the influence of societal factors on integration, such as social capital, discrimination, and the context of reception – in other words, the opportunities and challenges presented by the host society. Analysis just published by Eurofound, which focuses specifically on how people with a migration background integrate into the labour market of their host country, has found that the region of origin plays a bigger role than migrant status as such. Immigrants from all regions of the world, except North America, are more likely to hold jobs lower down the occupational ladder than the native population. However, people of North African origin and women of Asian background are especially disadvantaged, because they are also much less likely to be active in the labour market at all. Only women of Latin American origin have a higher probability of participating in the labour market than nationals. Overall, the evidence suggests that there is no automatic gradual assimilation of immigrants and their descendants into the same patterns of employment as natives, with many instances of persistent disadvantage. Eurofound’s research is based on nine EU Member States, some with a long experience of immigration (Austria, Belgium, France, Sweden and the UK) and others with more recent experience (all from southern Europe: Greece, Italy, Portugal and Spain). 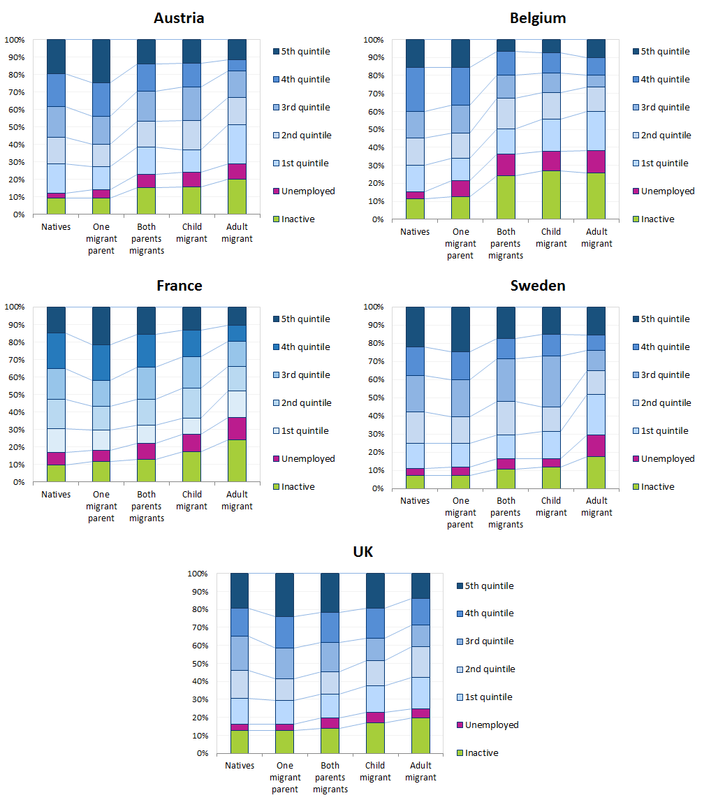 To examine integration across generations, the analysis looked at four different migrant statuses, from the most clearly migrant to the most assimilated: 1) born abroad and migrated as an adult; 2) born abroad and migrated as a child; 3) born in the host country but with both parents born abroad; and 4) born in the host country and with one parent born abroad. As the figure below illustrates, those who migrated as adults are significantly disadvantaged compared to nationals of the country: more are unemployed (not working and looking for work) and economically inactive (not working and not looking for work). They are also more likely to occupy lower-paid jobs (indicated on the charts by ‘1st quintile’, referring to the lowest-paid quintile of employment, while ‘5th quintile’ is the highest-paid). Only in the countries with a longer immigration tradition – Sweden and the UK, particularly – is there a smoother transition from the labour market pattern of adult migrants through to the pattern of the native population, which is somewhat consistent with the hypothesis of a linear process of integration. The analysis also found a significant diversity in labour market integration patterns across the nine countries. Migrants to Sweden and the UK and their descendants have had the best work prospects, in terms of both employment and occupational opportunities, while Austria, Belgium and France are in a middling position. As for the countries where immigration is a more recent phenomenon – the southern European Member States – immigrants have higher levels of labour market participation, but they are also more likely to be in low-paid jobs. The economies of these countries grew rapidly between 1995 and 2007, with an expansion of low-skilled and low-paid sectors such as construction and personal services. The patterns of labour market integration among immigrants in these countries suggest that they participated in this fast economic growth, but they were often hired into jobs at the bottom of the occupational ladder in those low-paid sectors. The message from these results is that the labour market integration of people with a migration background will not come automatically over time through the assimilation of successive generations. The concentration of immigrants from certain regions of the world in low-paid jobs in most countries points towards the existence of ethnic segregation in occupations. Policies need to focus on reducing this segregation and to aim for the economic integration of immigrants with or without acculturation into the host society. For this to be effective, difficulties associated with specific regions of origin need to be better understood and tackled more specifically. However, the evidence of better prospects for immigrants in some Member States is ground for optimism: not only does this show that better integration is indeed possible, but it also provides good examples that can be studied and emulated. The factors that explain the better performance of Sweden and the UK should be isolated, to extract policy lessons that could be shared with other countries.